One thing that is very important, even before you start decorating a room, has to do with the color scheme to choose from. Like light, it is totally linked to color! The combination of colors you choose is crucial for the space to have a balance and be pleasant to our senses. We know that we do not have to mix certain colors and nevertheless we like to break some rules, it is necessary to distinguish what is a good option to what is not. So we decided to go to the kitchen. We focus our attention in this room; we think that the decoration of this space requires exactly the same dedication on our part. In fact, in the decoration of your home you deserve to put your time and energy to support you in it. The kitchen is no exception. Once again we have great suggestions to give you…. Because your kitchen equipment can also have a color, present another very successful example that also combines two colors: black and chrome. This is not such an unusual combination, it is still quite classic on the contrary, and the result is undoubtedly totally our taste. These two colors can be easily combined with others, without compromising anything. We start with an example of everything we like. In fact, it is not a color that is thought for a kitchen. Are they or do you agree? The pastel blue color is not a color so common in this type of room, but there is no reason not to use it since we see the end result extremely attractive. In this particular case, we not only have a blue note, a whole wall, which gives a unique touch. Cleverly combined with white. A window that creates a very different and pleasant sifted light. What a unexpected examples! Quite a surprise! The kitchen furniture can also show colors, all can have a color. It’s something wonderful in the context of decoration! Therefore, here we present an example that uses a combination of colors that works very well: black with light wood. This combination is a supreme example of elegance and good taste. As in reality, the whole kitchen! Play with two colors, can be very interesting and is at the same time ‘half’ of the decoration. The choice of colors can be what you want, bets for simple furniture, not necessarily minimalist, and gives free rein to the imagination when choosing colors. 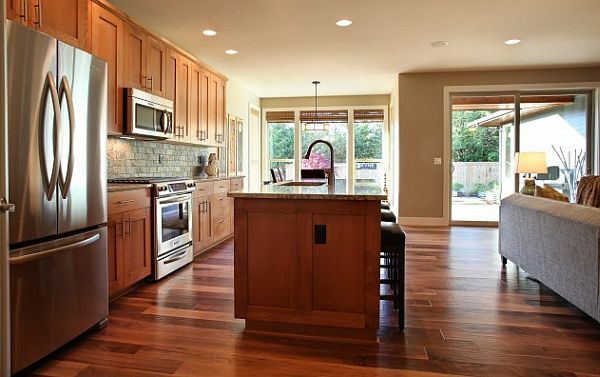 The floor of a kitchen is something that must be chosen with care. The example that is presented is not at all one of the most practical, but it is undoubtedly one of the most beautiful. A wooden floor, whatever the room is always a safe bet, it is almost impossible that this does not become simply something wonderful. If you agree like us, a connoisseur of this type of material has no problem choosing it. With the right treatment and a little care, which is not too different from the normal, it is just what you need to have in your kitchen a fantastic atmosphere where you want to spend even more time. When we get to the color of the kitchen furniture, we like to emphasize another classic: the white cabinets. White cabinets are timeless and never fail, the great advantage of this is that everything can change, and it will always adapt. 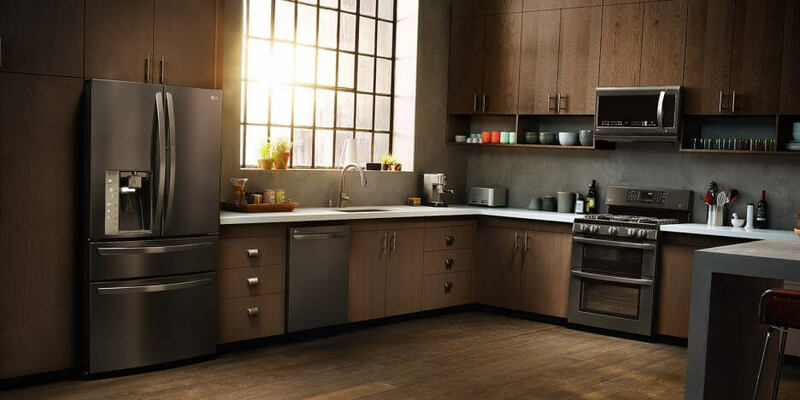 The big question with cabinets has to do with a very simple but very key aspect and is the fact that they are a very important part of our kitchens, since inside them we keep all the utensils that we use in this room. Often, these turn out to occupy all the space on the walls. White cabinets can be a great option for a minimalist kitchen, also for a kitchen whose decoration is based on a basic color scheme with different color accents. In either case it is an option that we recommend. To finish our article we talked about curtains and blinds. The cabinet in white does not risk decoration. If what you want to have in your kitchen is not like traditional curtains, you want to give a more daring touch to the space; we have to present this example as a solution. Beyond practical and effective, it gives a touch of modernity. For the curtains in the kitchen it is usually advised lighter elements, which allow the entry of light. You can certainly choose from many models that also combine very well with this room. That they fulfill the main function of the curtains and that at the same time it will be constituted as a decorative note.